3. Zac makes excellent points regarding some of the advantages of getting an education at a public university, such as UMass Amherst, where I teach. You can read about other amazing things that Zac accomplished even as a sophomore at UMass Amherst (including how he got his book deal) on the UMass Amherst College of Social and of Behavioral Sciences website page here. In that interview, he also extols the great education that he is getting at UMass Amherst. 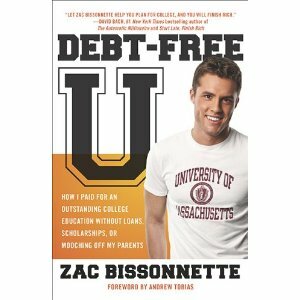 I do believe that his book with the full title: Debt-Free U: How I Paid for an Outstanding College Education without Loans, Scholarships, or Mooching off my Parents will be a best-seller. We wish him much continuing success. In an interesting Op-Ed piece in The New York Times, Dr. Laura Tyson of the Haas School of Business at UC Berkeley, and a member of President Obama's Economic Recovery Advisory Board, is calling for a new stimulus package to invest in the nation's infrastructure. My colleagues and I at the Supernetworks Center have been writing a lot on how to identify not only the costs of infrastructure degradation from our roads and bridges and even the Internet, from an economic and performance standpoint, but also on how to identify the effects of enhancement and investments by taking into consideration the behavior of those who will ultimately be using the infrastructure. In addition, it is imperative that the investments are made with cognizance of climate change and how best to adapt our infrastructure investments accordingly from transportation networks to supply chains and electric power generation and distribution networks. 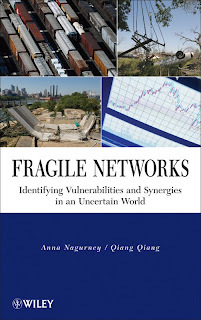 Our paper, which contains highlights from our research and major findings, but in a more condensed fashion than found in our Fragile Networks book is entitled: "Fragile Networks: Identifying Vulnerabilities and Synergies in an Uncertain Age,"and it is in press in the journal International Transactions in Operational Research. I just hope that if a new stimulus does get passed and even an Infrastructure Bank established, that economists, engineers, operations researchers and management scientists, and even environmental scientists, all work together so that what gets built, renovated, expanded, enhanced, and where, can have the greatest positive impact economically not only in the short-term but also in the long-term. Our paper, "Fashion Supply Chain Management Through Cost and Time Minimization from a Network Perspective," is now available online on the Supernetworks Center website. This invited paper was co-authored with one of my doctoral students, Min Yu, for an edited volume on fashion supply chains. As the abstract states: In this paper, we consider fashion supply chain management through cost and time minimization, from a network perspective and in the case of multiple fashion products. We develop a multicriteria decision-making optimization model subject to multimarket demand satisfaction, and provide its equivalent variational inequality formulation. The model allows for the determination of the optimal multiproduct fashion flows associated with the supply chain network activities, in the form of: manufacturing, storage, and distribution, and identifies the minimal total operational cost and total time consumption.The model allows the decision-maker to weight the total time minimization objective of the supply chain network for the time-sensitive fashion products, as appropriate. Furthermore, we discuss potential applications to fashion supply chain management through a series of numerical examples. We very much enjoyed conducting the research on which this paper is based. Working with students on research can take one on intellectual journeys that yield discoveries in terms of new analytical methodologies as well as conceptual frameworks and exciting new applications, that one may not have pursued individually. Collaborations are key to successful research and, when they work well, yield intellectual, professional, and personal rewards. Building networks through collaborations, beginning at one's educational institutions, may yield life-long partnerships. This is something that I aim to support as the Director of the Virtual Center for Supernetworks. This is an exciting time of the year when we begin to welcome new students and associates. Our newest Student Center Associate is Mr. Nathan Kollett, who has matriculated into our doctoral program in Management Science at the Isenberg School and who for the past two years has worked at State Street Corporation in Boston. Speaking of "school ties," the latest issue of Vanity Fair has several articles featuring my fellow alums from Brown University with one article on Steve Rattner, Obama's "Car Czar," who was the former editor of the Brown Daily Herald, and another on the revised "Preppy Handbook," True Prep, by Lisa Birnbach, another Brown alum, with Chip Kidd. True Prep will be released on September 7 and I am sure that it will be very entertaining reading. I am a product of an inner city high school, Yonkers High School, which had outstanding teachers and I received four degrees from Brown University, including my PhD. The excerpt from True Prep states that a preppy always has a navy blazer, a fashion piece that is part of my frequent flier uniform, so I guess that aspect of my academic ambience ultimately did rub off on me or perhaps I just subconsciously adopted the uniform of the male execs in business class. The New York Times is reporting that the proposed merger of Continental and United Airlines has been approved. It is expected that the deal will now move forward quickly and result in the world's largest airline. According to The Times: In a statement posted on its Web site, the Justice Department said it had “closed its investigation” into the proposed merger after United and Continental agreed to give take-and landing slots to Southwest Airlines at Newark Liberty International Airport. “United and Continental entered into the arrangement with Southwest in response to the department’s principal concerns regarding the competitive effects of the proposed United/Continental merger,” the Justice Department said in its statement. This news I find especially exciting since we have been conducting a lot of research on mergers and acquisitions from a network perspective in both competitive, such as oligopolistic, settings, which is the industrial structure of many airlines, and in cooperative environments, such as in humanitarian logistics and operations where there may be teaming for disaster relief. My paper, "Formulation and Analysis of Horizontal Mergers Among Oligopolistic Firms with Insights Into the Merger Paradox: A Supply Chain Network Perspective," has now been published online in the journal Computational Management Science and according to a message that I received yesterday from the publisher of this journal, Springer, it should be appearing in the hardcopy issue soon. Another more personal connection is that my college room-mate from Brown University, Teresa Davila, is a United Airlines stewardess and language specialist. I hope that the corporate cultures of these two airlines mesh well so that the employees are comfortable when it ultimately takes place. I am a former Premier flier on United and my recent long distance flights on this airline were to/from spectacular Honolulu and to/from Buenos Aires, Argentina! The Worst Traffic Jam Ever -- 10 Days and 60 Miles! I am getting ready to teach two courses this Fall, including my Transportation & Logistics course, to which I always bring material and news items from the real-world. Just in time for my first class, is the news, as both The Guardian and The New York Times report, of what is being reported as the worst traffic jam ever, which occurred on a highway west of Beijing, which is part of the Beijing-Tibet highway, and lasted 10 days and 60 miles! The drivers behaved quite well during this logjam and you can view some of the photos of the gridlock here. One of the reasons for this surreal traffic jam was that construction had started on this major thoroughfare, thus reducing its capacity. Plus, this is a major highway for the transportation not only of passenger vehicles but also of trucks carrying freight and especially coal. Room for Debate in The New York Times has interesting takes on this mega traffic jam, with one debater stating that such a monumental traffic jam would never happen in the US. Interestingly, as well, many of the truck drivers in order to avoid tolls (and being weighed) would rather choose a longer route, as happened in this case, in China. Tolls in which there is the money vs. time issue is another topic that I will be teaching in my course. In our Fragile Networks book we discuss how the transportation network design and the reduction of capacity can affect traffic flows, both major issues in the worst traffic jam ever. Also, we quantify the effects of enhancements of network capacity, such as the increase in road capacity. Clearly, to have effective transportation and logistics systems, one must construct the appropriate critical infrastructure, in the form of roads, bridges, and even rails, sea and air routes, to support the flows! The subject of Transportation & Logistics is always fascinating! With Fall around the corner, and students starting to arrive at colleges around the country, the 2010-2011 academic year will soon begin. There is always a lot of excitement and anticipation from the new and returning students, their families, as well as from the professors who will be teaching the courses that the students will be taking. A new academic year brings new challenges, opportunities, experiences and adventures, friendships, and discoveries. As Director of the Virtual Center for Supernetworks at the Isenberg School of Management at UMass Amherst, I edit the Supernetwork Sentinel, which is our newsletter, and which gets published in Fall, Spring, and Summer editions. 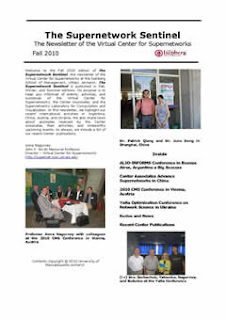 The Fall 2010 Supernetwork Sentinel is now online and I hope that you enjoy reading about our professional activities that, this past summer alone, took us to Argentina, China, Austria, and Ukraine! The research that the Center Associates are involved in include such timely topics as supply chain network design of critical needs products from pharmaceuticals to vaccines to sustainable supply chains and even fashion supply chain management (in which time vs. cost is also a big issue)! We study network fragility and vulnerability in transportation, logistics (including humanitarian operations), the Internet, electric power and energy networks, and even in finance and model how human behavior affects such systems. We also construct metrics that can assess the performance of networks and identify potential synergies with applications as varied as corporate mergers and acquisitions and the teaming of organizations for disaster relief. We quantify, through advanced analytics, cooperative vs. competitive behavior and identify and explain where paradoxes such as the Braess paradox can (and cannot) occur. Since supernetworks are networks of networks, their applications are very exciting and vast! The methodologies that our researchers use to capture essential components of complex networks include: game theory, network optimization, nonlinear programming, multicriteria decision-making, risk management, variational inequalities, and projected dynamical systems. We have been very busy this summer and are looking forward to a very special, productive, and fascinating new academic year! All of our newsletters can be accessed here. While my family and I were enjoying the beauty and serenity of the Adirondacks while spending several days in Lake Placid, there were several major transportation disruptions in the NYC area that affected train travel (the LIRR, New Jersey Transit, and even Amtrak) over two days. The electrical travel chaos on the Long Island Rail Road on Monday offered a frustrating reminder of the fragility of a rail network still dependent on antiquated equipment. Embedded along the railroad tracks by Jamaica Station, and soaked by rain from the night before, two or more cables shorted out around 11 a.m., the authorities said, sending a pulse of electricity into a nearby train control tower and setting fire to the century-old equipment inside. It seems improbable that a piece of ancient machinery, a contraption of levers and pulleys designed in 1913, would be critical to the successful operation of one of the nation’s largest commuter railroads. But the machinery, which remained on fire for about an hour, controls the 155 track switches at a crucial choke point: Jamaica Station, which 10 of the railroad’s 11 branches must travel through to get in and out of New York City. For several hours, nearly the entire railroad ground to a halt. The fragility of networks, from transportation to the Internet, and even supply chains and financial networks, was explored in our book, Fragile Networks: Identifying Vulnerabilities and Synergies in an Uncertain World. Above I feature photos taken at the spectacular station in Lake Saranac in upstate New York, where, in contrast, the Adirondack Scenic Railroad was working beautifully and ferrying tourists between Lake Place and Lake Saranac. The station is simply gorgeous and we felt as though we were transported to another era (which we were). My husband is a huge train buff but we all enjoyed the experience a lot from seeing the station outside and inside to viewing the turning around of the engine to reading the historic boards inside the station and even talking to the pleasant gift shop operator. As for train travel from NYC, we were told that, in the late 1800s, one would leave NYC at midnight and then arrive in Lake Saranac at 4PM the next day. This Adirondack area was known for its restorative benefits for those with lung ailments and for "cures" for tuberculosis. There were even trains that ferried sick passengers. A notable resident of the area, who lived there for 7 months (and whose residence we also toured), was Robert Louis Stevenson, the author of Treasure Island and Dr. Jekyll and Mr. Hyde, among other works. He was born in Scotland and was very sickly (and a chain smoker). His wife credited the 7 months that they stayed at Lake Saranac as giving him 7 more years of life. I am delighted to announce that the presentations in the session that I organized for the 2010 Computational Management Science conference that took place recently in Vienna, Austria are now online. The talks cover such important and timely topics as supply chain network design for critical needs products, earmarks for humanitarian operations for disaster relief, and vulnerability and disruptions in supply chain networks. The talks are in pdf format and are downloadable. I thank the invited speakers for their contributions. Photos from the conference are available here. The New York Times has an article on the locavore movement, which states that the movement started in the Berkshires in western Massachusetts, where we now reside. Locavore refers to food that is locally grown and consumed and with the latest news about eggs and salmonella, having food that one trusts is healthy and, I might add, delicious, too, is a special treat. We are now in the midst of an early harvest and are enjoying fresh berries, corn, and other local produce. In addition, it is special when one can talk to, and even know, the farmers' names. Since the new academic year is approaching with hectic schedules before us and many of the conferences that I was committed to speaking at in various parts of the world now over, we are finding time to reconnect with our relatives this summer. Many family members, as is typical of families living in the US today, are spread out over great distances, but some relatives of ours, luckily, are within driving distance. Last Sunday, we visited what we call our "country" cousins who live in Putnam County, NY. The mother in the household runs a large kennel, a local farm, and has 4 young children. She operates like a CEO (but without the staff) and is simply amazing. We arrived via a winding, rock-covered road to be greeted first by wild turkeys. Later, three deer scampering over the road extended their greetings to us. We were treated to home-made goat cheese with a puree of wild cherries and home-made maple syrup, quiche made from their hens' eggs, and bacon from their (former) pigs. We set out to see the kennel with quite a few dogs being rescue dogs, and others being housed there and very well-taken care of while their owners were on vacation. What stunned us was how the farm animals were wandering freely and all the pigs, the cow, the sheep, and the goats, plus her dog had names. We were mesmerized by how the children interacted and helped out with the animals. They had also rescued 4 kittens, named, respectively, Lady, Gaga, Adam, and Lambert, but, somehow Adam had gotten away. He will certainly find companionship on the farm. Two goats, named Elvis (white) and Dandelion (black), both featured in photos above, did not want to leave my side. The cow named Sally thinks that she is a sheep, and as a storm was approaching, she headed towards the sheep pen. The cousins told us that the animals are great predictors of weather changes and especially of storms. The pigs, also featured above, are named Spotty and Snorty. What a wonderful time we had during which we enjoyed our relatives and so many wonderful animals in the midst of nature! 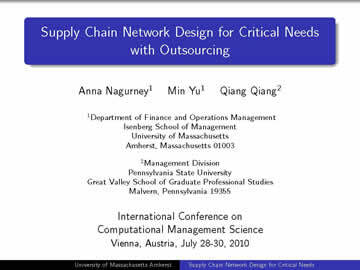 Our paper, "Supply Chain Network Design for Critical Needs with Outsourcing," has now been made available online by the publisher, John Wiley & Sons, in the journal Papers in Regional Science. With the number of disasters growing over the past decade as well as the number of people affected by disasters, the design of supply chain networks for critical needs products, such as water, food, and medicines, is of paramount importance. Such problems are uniquely challenging since the needs of the affected population should be met as closely as possible with the undersupply of food, water, and medicines, leading to loss of life. At the same time, the oversupply of products may also carry costs, due to unnecessary waste and even, possibly, environmental damage. In fact, the United Nations is reporting in today's New York Times that the horrific floods in Pakistan are resulting in severe shortages of such critical needs supplies as food and water. In our paper, we developed a mathematical model that allows for the optimal design of such supply chain networks at minimal total cost and with the satisfaction of the product demands at the demand points, as closely as possible. 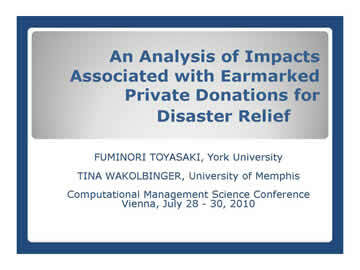 Research on which this paper was based, which was conducted also by Professor Patrick Qiang and my doctoral student, Min Yu, was inspired by the Humanitarian Logistics: Networks for Africa Conference that I organized at the Rockefeller Foundation's Bellagio Center on Lake Como. The Rockefeller Foundation and this workshop are acknowledged in the paper. We also thank Professor Manfred Fischer of the Vienna University of Business and Economics for his support. Professor Fischer was my host in Vienna in March 2009 when I delivered the lecture, "Synergies and Vulnerabilities of Supply Chain Networks in a Global Economy." At a dinner party at Professor Georg Pflug's lovely apartment in Vienna, Austria, late last month a group of us who had been invited as part of the Computational Management Science conference that was taking place there were talking about the beautiful minds in our field. We were discussing how we had lost Professor George Dantzig of Stanford at age 90 a few years back and were chatting about how there were still giants among us who were doing research well past what one would consider to be retirement age. 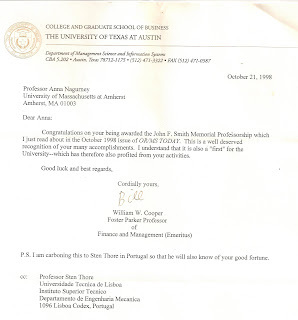 We singled out Professor William "Bill" Cooper of the University of Texas Austin. Little did I realize that, while we were talking about him, it was only a few days past his 96th birthday, which took place on July 23! The McCombs School of Business at the University of Texas issued this nice article to mark this grand achievement of longevity and productivity. Professor Cooper, at age 66, after having previously taught at Carnegie Mellon University and at Harvard University, joined the business school faculty of the University of Texas Austin. His professional contributions in accounting, and in operations research and management science are legendary and, I might add, his productivity actually increased in his decade of 78-88 years of age! Professor Cooper, although now officially retired, still comes to work, and says that he wants to die while living and not from a cold or from pneumonia. Professor Bill Cooper will be honored at the 2010 INFORMS National Meeting, which will take place next November (conveniently) in Austin, Texas. I plan on being there to thank him and to congratulate him for all of his accomplishments and for his impact. 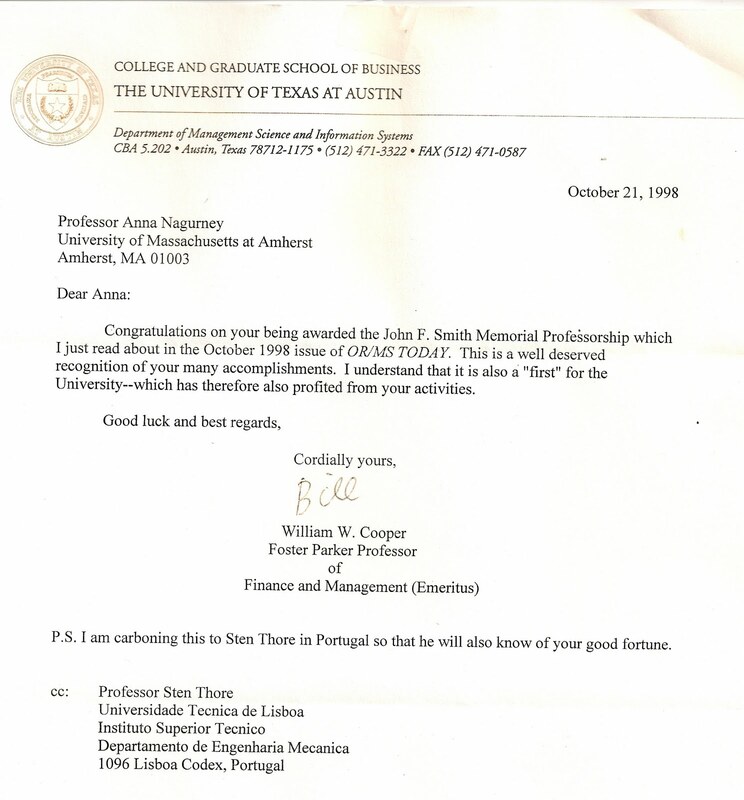 Above is a letter I received from Professor Cooper when I was named the John F. Smith Memorial Professor (a chaired professorship). The letter hangs in my office directly above my desk. The fact that at age 84, he would take the time to write and have such a letter typed and even mailed to a mutual friend, speaks to the kindness, thoughtfulness, and manners of this titan. Yesterday, one of my doctoral students and I finished a paper on fashion supply chain management that we were invited to write. Today, I see that The New York Times has an article on the fashion and apparel industry with a call for minimizing waste. I enjoyed the article a lot since it highlighted the supply chain aspects of emission reduction, including the emissions generated in the transportation of fashion products, as well as the design of fashion products, such as jeans,which can be notoriously, and, ironically, I might add, environmentally-unfriendly due to the dyes used. What is particularly challenging about fashion and apparel design, as the article emphasizes, is that fashion should also look good. Hence, perhaps we now should also be concerned, as operations researchers and supply chain network designers, not only about the sustainability issues but also about the aesthetics, or shall we leave it to the Parsons School of Design folks who were quoted in the article. As for minimizing waste in this application sector, our discipline can contribute immensely since we have a long history and excellent track record in a variety of "cutting" problems, whether for paper products or fabric. Our recent paper, "Sustainable Supply Chain Network Design: A Multicriteria Perspective," just published in the International Journal of Sustainable Engineering is definitely relevant to this topic as is the paper, "Fashion Supply Chain Management Through Cost and Time Minimization from a Network Perspective," which we have just completed. If someone had told me a while back that I would be doing research on fashion supply chain management, I would have said that there are other problems of greater interest to me. I do recall, however, being at a terrific workshop at Stanford years back with both Professor Kenneth Arrow, the Nobel Laureate, in the audience, and Professor George Dantzig, the father of operations research, along with my former dissertation advisor at Brown University, Stella Dafermos. After my talk at the workshop, someone remarked that they thought I was talking about "Wardrobe" equilibrium, rather than "Wardrop" equilibrium (well-known to those who work and study transportation and logistics). I had a good laugh after this. Clothes are rather basic and important, don't you think, and if one can assist this industry in sustainability, one can make a big impact. Brown University has officially announced that it has been awarded $15.5 million dollars from the National Science Foundation (NSF) for a math institute, one of eight, and the only one in New England! Dr. Jill Pipher, the chair of Brown's Math Department, will be heading the institute, which will be known as the Institute for Computational and Experimental Mathematics (ICERM). This is fantastic news and I have already congratulated Dr. Pipher. The scientific board that will be advising the new institute is outstanding and includes Dr. Brenda Dietrich of IBM, who is well-known to the INFORMS operations research communities. The Chair of the scientific board is Dr. Andrea Bertozzi of UCLA. Dr. Pipher invited me to speak at the Brown University Symposium for Undergraduates in Mathematical Sciences (SUMS) back in 2007 and asked me to speak on operations research. My talk was titled "Operations Research and the Captivating Study of Networks and Complex Decision-Making." I wish the institute much success as it develops its programs, with some preliminary ideas already posted on IRCEM's new website. I am certain that it will not only promote research but also diversity and undergraduate and graduate student experiences. As a recipient of 3 degrees in Applied Mathematics from Brown University, this is news that deserves a lot of celebrating! Having flown on 8 flights recently over 2 weeks in 4 countries, I am glad to be on terra firma. Needless to say, as any frequent flier, I could not miss the major news story of the "escape" of the Jet Blue flight attendant, Steve Slater, from his landed flight using a chute onto the tarmac of the JFK airport following his "interactions" with a passenger upon landing. There is an article in USA Today, "JetBlue flight attendant strikes a nerve with stressed workers," which caught my attention since it quotes my former colleague at the Isenberg School at UMass Amherst, Dr. Joel Naroff (who owned a home in North Amherst) and who is also a fellow Brown University PhD (in economics, though). Dr. Naroff is now President of his own consulting company. The USA Today article states that: Slater did what many workers fantasize about and may do with increasing frequency — albeit with less showmanship — once the economy rebounds, with Dr. Naroff stating that: "I don't think we should be surprised that once the economy starts ... picking up, there's a massive relocation of workers who want out as fast as they possibly can." "That's the warning that I don't think businesses really recognize: You can pull this off now because there isn't really an option, but once there's an option, it's going to be payback time," Naroff says. "You're going to be losing some of your best people." Dr. Naroff always was articulate (and, as I recall, had a terrific sense of humor). He further states in USA Today: "Clearly, the massive drive to get more productivity and more output out of workers is running into a wall." "We're working too hard, all the blood's out of the stone, and it's now time to look for a new stone." Also, interestingly, my college room-mate at Brown (for two years we lived together in Diman Hall on the frat quad) and a fellow Applied Mathematics major, after several years in the insurance industry, opted out to become a social director of several cruise lines, only to pursue a career as an international flight attendant and language specialist for United Airlines. Whenever I fly I make a point of engaging flight attendants in conversation, especially on those long distance flights, that I have had more than my share of lately. This way I get to stand rather than sit for hours and I also learn about their challenging lives and lifestyles. It's official -- our paper, "Sustainable Supply Chain Network Design: A Multicriteria Perspective," has now been published in the International Journal of Sustainable Engineering. It appears in the September issue, volume 3 (2010), pp. 189-197 and can be accessed here. The paper already has been receiving a lot of attention based on queries that I have gotten from publishers to expand the paper into a book. With all the disasters in the world from floods to heat waves and fires, rigorous methodological tools that determine how to minimize the carbon footprint through sustainable supply chain network design can make a big difference in terms of emissions and costs. Supply chains, as complex networks, consisting of manufacturing plants, different modes of transportation and distribution, as well as possible storage technologies, can span the globe and, hence, identifying the optimal design of such networks in terms of both costs and emissions, notably, in terms of the carbon generated, can impact not only a firm's profits but also its reputation through an enhanced environmental reputation. We are delighted that our research and paper can contribute in this direction. I returned from two weeks of heavy travel in Europe to speak at conferences to find alot of mail waiting for me in the mailroom at the Isenberg School. There were several packages, which, I suspected, might be tenure or promotion files to evaluate. After two days of processing and catching up with email plus reconnecting with my family I decided to tackle all the other mail. My conferences in Vienna, Austria and in Yalta, Ukraine (see my earlier blogposts) required 8 different flights so in my travels I got to meet new people, enjoyed the two conferences immensely and experienced also a part of the world where my parents had come from (Ukraine) that I had previously never been to. The experiences were intense and vivid and I returned to Amherst, Massachusetts truly happy. It certainly didn't hurt that when I opened my mailer at 3AM the next morning I had a message from an editor of a journal accepting a paper I had worked on for months this past year plus the weather had cooled in the Northeast and Amherst was verdant and lovely. And an article in yesterday's New York Times by Stephanie Bloom, "But Will It Make You Happy?" further reinforced recent studies by psychologists that it is better to take a vacation than engage in just purchasing "more stuff." Although I would not call extensive professional travel over a relatively short time period a "vacation." I opened a FedEx package from Secaucus, New Jersey to find a letter from Mr. Ken Bouyer of Enst & Young, the renowened accounting firm. The letter was accompanied by a beautiful standing frame from MoMA (the Museum of Moden Art) in NYC and one of my favorite destinations with the above placard. In an email message, a former student of mine at the Isenberg School, who had just graduated in May with his degree in Operations Management, informed me that he had submitted my nomination for this award. I was stunned by the kindness and thoughtfulness of this student who took the time to recognize the promotion of diversity and inclusiveness. I might add that he is a white male (not that it matters). 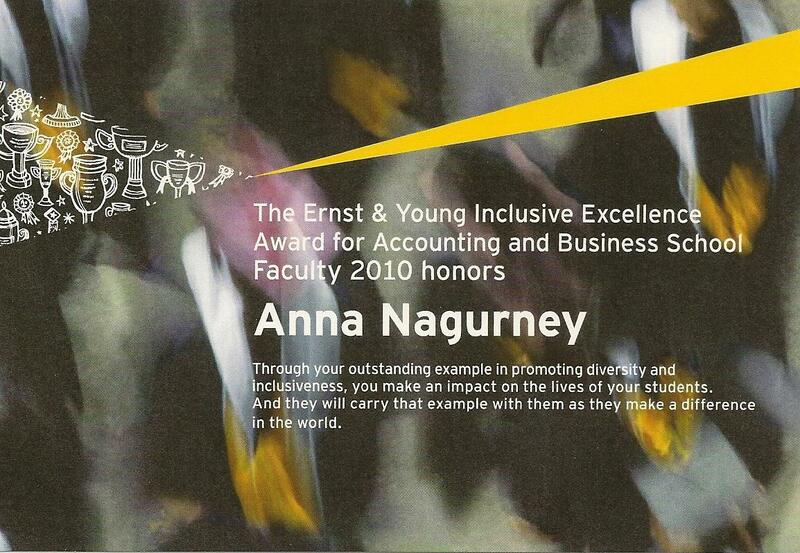 Kudos also to Ernst & Young for valuing diversity and inclusiveness and the promotion thereof in the global workplace. Two years ago, the Isenberg School had received a grant from Ernst & Young. Clearly, an essential part of "happiness" is not only those special experiences but the strength of relationships and ties that we build over time wherever our work or our travels take us. The Yalta Optimization Conference on “Network Science” took place August 2-4, 2010 in one of the world's most renowned historical conference sites in Yalta, Ukraine. The conference was organized by Professor Sergiy Butenko from Texas A&M University, Professor Oleg Prokopyev from the University of Pittsburgh, and by Professor Volodymyr P. Shylo of the Glushkov Institute of Cybernetics of the National Academy of Sciences in Kyiv, Ukraine. Funding for the conference, which attracted speakers and participants from the US, Ukraine, Romania, Ialy, Sweden, and Russia, was provided by the National Science Foundation (NSF), with support from the Glushkov Institute of Cybernetics, Texas A&M University's Department of Industrial and Systems Engineering, and the University of Pittsburgh's Department of Industrial Engineering. A notable aspect of the conference was the inclusion of undergraduate and graduate students who had been participants in the International Research Experience for Students (IRES) Workshop on Discrete and Nondifferentiable Optimization: Algorithms and Applications, also funded by NSF, that took place at the Glushkov Institute in Kyiv, July 20-August 10, 2010, with participants from both the US and Ukraine. Several students from the workshop delivered talks at this conference and the fields that they represented included optimization, operations research, computer science, engineering, and statistics. which is also the title of my latest book, with Professor Patrick Qiang , and published in 2009 by John Wiley & Sons. Another keynote talk was given by Professor Yaroslav Sergeyev of the University of Calabria in Italy and of the N. I. Lobachevsky State University of Nizhni Novgorod in Russia. Among the talks, which focused both on the methodological aspects of networks from transportation and logistics applications to biological and medical ones, was one given by Dr. Vitaliy Yatsenko of the Space Research Institute of the National Academy of Sciences of Ukraine, who spoke on sensor networks and weather in outer space with risk assessment. In addition to the scientific presentations and discussions, the conference also included a social program with a banquet. The venue of the conference was the Yalta Hotel, a 1,000 room hotel. The conference program with talks and abstracts can be accessed here. Above I have included some photos taken at this excellent conference. For a full page of additional photos, which are downloadable, click here. I thank the organizers of this conference for so many wonderful talks, discussions, and, most of all, for the very special memories. Last week I spent 4 nights at the Hotel Yalta in Crimea, Ukraine. The Hotel Yalta is a 1,000 room hotel complex dating to the Soviet era with the Black Sea on one side of it and the Crimean Mountains behind. I was at the hotel to take part in the 3rd Yalta Conference on Optimization (which will be the subject of a future blogpost, so do stay tuned). The Yalta hotel is an hour and a half from the Simferopol airport. Yalta is famous for, among other reasons, the Yalta Conference, which is sometimes referred to as the Crimea Conference, which took place back in 1945. I was very lucky that, upon checking in, at about 10PM last Saturday, I received a key to Room 986, which was actually a suite with a living room and a bedroom, each with a hall upon entry and a balcony, with majestic views (see above). There were multiple doors, which were heavy, and which helped to block out hallway noise, so one could get much-needed sleep. The hotel and town, which was a walk down a windy, narrow path, were both filled with tourists, speaking, primarily, Russian, with some conversing in Ukrainian. The "academic" tourists, typically, conversed in English, although several of us were non-native speakers of English and had origins (or heritage) from this part of the world. I enjoyed the spirit of the people that I saw and encountered in Yalta. Many were there with their families and it is common (Yalta is sometimes called the Honolulu of this part of Europe) to see people strolling everywhere in their bathing suits (with women often wearing sarongs as coverups). The beaches are filled not with soft sand but rather with large rocks (this is not the Jersey Shore or Cape Cod or Florida) and the folks plant their towels to mark their spots. There are restaurants that line the beaches and small kiosks with souvenirs (although I did not find anything worthwhile to purchase). Fruit stands where water can also be bought (necessary in the heat here) can be found on the path from the hotel to the town and the peaches and plums were exquisite. I washed the fresh fruit with bottled water and avoided drinking the tap water, which I hear comes from the Dnieper River with chlorine added to it. The hotel provided a breakfast buffet on the 16th floor, which is not air-conditioned, but I ate outside on the balcony and enjoyed the seagulls and spectacular views. During our conference banquet in the same location (I will write about it soon) we had fans to help us cool off. Staying at this hotel and walking around the town and boardwalk were quite the experiences. The organizers of the conference gave us "free" time in the afternoon to explore, which was very much appreciated. Being able to speak both Ukrainian and Russian definitely helped and added to my comfort level. The photos featured above, which I took last week in Yalta, speak for themselves, so enjoy! Now that I am (safely) back from almost two weeks of air (and other) travel in Europe to speak at conferences, I can reflect on my observations regarding airport security (or lack thereof). As an academic, I speak at conferences frequently, and especially, as a female, I believe that it is very important to, when asked, to accept invitations to give plenary talks. Such invitations brought me recently to the 2010 Computational Management Science conference in Vienna, Austria and to the Yalta Optimization Conference in the Crimea, Ukraine. I was traveling to these conferences alone. What struck me in a dramatic fashion was the different levels of airport security. My journey began on July 26, 2010, when I flew out of Logan airport in Boston and I flew on a total of 8 different flights over the subsequent 12 days, getting back to Boston on August 5 (and landing just before a major thunderstorm hit the area). I conduct research in operations, with a focus on transportation, logistics, and network systems, and have a special interest in risk management and safety and security issues. The airport security at Logan was, as one would expect, visible and thorough, and all air travelers had to remove their shoes, jackets, etc., while passing through security, and to have their liquids in plastic quart bags. My journey took me through the Frankfurt airport (en route to Vienna and then back from Vienna to Boston after my conference in Ukraine). Strangely enough, passengers did not need to remove their shoes (which is standard in every airport that I have flown through in the US in the past several years) when going through security at the Frankfurt airport but we did have to have the liquids that we were carrying through security in appropriately-sized plastic bags. After my conference in Vienna (please see my earlier blogposts with photos on this great experience) I flew to the Simferopol airport, which is in the Crimea, Ukraine, through Kiev, the capital of Ukraine. My flights in Ukraine were on Ukraine International Airlines, and they were, unexpectedly, very comfortable and delightful. The Yalta conference was a fascinating experience scientifically, culturally, and also personally, since this was my first trip to Ukraine, the country of the birthplace of my parents (and Ukrainian is my first language with Russian being my fifth). Landing at the Simferopol airport, we disembarked under the skies, which were turning to dusk to a welcoming by a sea of taxi drivers (you can read about my driver "Igor" here). I urge all passengers to use the facilities of your airplane before disembarking your plane here since the restroom facilities are shocking (see bottom photo above). Not only is handicap-accessibility unknown but one has to lug the suitcases down slippery steps and then go up and down and then up again to reach a stall (with small wooden door) featured above. Yes, folks, I had nightmares after this travel experience and I have been to many countries. After the conference in Yalta, on August 4, 2010, I was back at the Simferopol airport to take my flight to Kiev and then onwards to Vienna before I would begin my journey back to Boston via Frankfurt. The almost gingerbread-looking house above is the terminal for intra-Ukraine flights. The landscaping, also featured above, is rather delightful. I noticed two gentlemen walking towards this terminal who were clearly tourists and who I had overheard speaking German so I spoke to them and they also spoke English (English is my second language and German my fourth). They were on my flight (see them drinking coffee above in the tiny airport coffeeshop) and, coincidentally (despite our flight being not even 1/3 full), had received seats next to me (21A,B,C). Some weird assignment algorithm must have been used for our seat allocation (or, perhaps, the gate agent just thought we were traveling together although we checked in separately). Now for the punchline, at security at the Simferopol airport, not only did we not have to remove our shoes, we did not have to remove our plastic bags with liquids, AND we were all carrying large plastic bottles of water since it was so hot! Once the three of us passed the so-called security, we looked at one another with wide eyes. One of the Germans remarked that he was praying that the plane would not blow up. He was a physicist and even made sure on our flight that folks had their electronic equipment turned off upon takeoff and landing. Waiting to board we were filled with anxiety and the plane (a Boeing) taxied for 15 minutes on a jetway with cracks and grass growing through. One of my new "friends" commented that if we were to have an emergency landing that it would be softened by the grass. Nothing like humor and jokes to alleviate some of the tension. We promised to all hold hands in the case of a "crash" landing. Well, we made it to Kiev, transfered to the international terminal, whose main feature was the Irish Pub, and we hung out together until they were off on towards Dusseldorf and I was off to Vienna. My overnight at the NH hotel by the Vienna airport was heavenly and, if I am ever stuck, for some reason, at the Vienna airport, where you certainly can't starve, I will definitely stay at this terrific business hotel.